For students majoring in mathematical economics, it's all about the numbers, but you will also learn economic theory, computational methods and analysis. You will study with faculty in the Department of Economics and the Department of Mathematics and Statistics. Your training will get you ready to do research and technical work in industries such as marketing, banking and finance; as well as for government agencies and private organizations here at home and around the world. Campus activities, organizations and strong internships will offer you opportunities to build leadership skills and connect with professionals in the field. Twelve full-time economics faculty members with doctorates, a passion for economics, and diverse teaching and research experience. Access to the Statistical Consulting & Research Center in a new $45 million Integrated Science & Engineering Laboratory Facility (ISELF) for research. Undergraduate work is solid foundation for graduate studies in economics, applied mathematics and statistics and finance engineering. 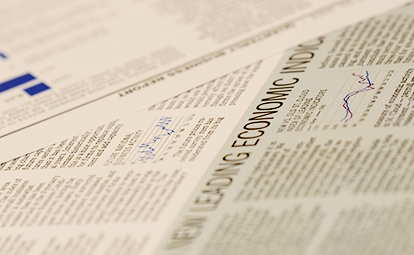 Faculty research published in books and journals such as American Economic Review; Journal of Money, Credit and Banking; and Journal of Public Economics. An annual Winter Institute gathers the best minds on economic issues and draws an audience from across the Midwest. It has hosted such notables as Milton Friedman and Federal Reserve Chairman Benjamin Bernanke. Notable alumnus: James Bullard '84 is president and CEO of the Federal Reserve Bank of St. Louis.